This is one of the many reasons why Kelsi and I got along so well in the three short months we knew each other; we are both always down for an adventure. So 8 months later, after not seeing each other in almost exactly a year, we reunited in a campsite called Acacia about a half hour outside of Nairobi. We were about to begin another 4 month adventure with 11 countries, 2 continents, and infinite amounts of laughter and fun! We went to bed that night listening to the sounds of lions roaring in the national park across the street… Life is sweet! We spent 2 full days in Nairobi before heading out on a tour southbound. The first morning we set out on a city tour with Edwin. All the staff at Acacia camp are incredible; they are helpful and friendly and will stick to you like glue anywhere off the camp grounds just to make sure you are safe! Edwin was our guide for the day and he was a great wealth of information about the city and local customs. We started by heading to a lookout point in the business district. 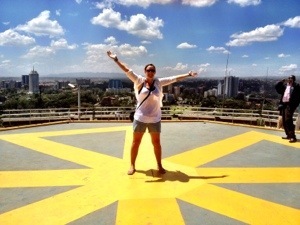 We climbed to the rooftop of a huge building in the center of the city. To our excitement, the roof had a helicopter landing pad that we got to stand on for a perfect 360 degree view of the stunning landscape! The city suburbs, spreading primarily East, are divided mainly by ethnicity and religion. This area of Kenya has a number of cultures all trying to live symbiotically. Unfortunately, from talking to locals, it seems like identifying Kenyans as “Kenyans” and not as “Arabs” or “Masai” or “Christians” is still a work in progress. As we continued our city tour, Edwin explained that crime in the city had depleted rapidly after a new police tactic came into play. “Don’t worry about anyone stealing your purse and running off with it,” he said “if that happens, just drop to the ground! There is a plain clothed police officer on every street corner in Nairobi that has the right to shoot anyone who robs another person!” Wow… Not sure of that made me feel any safer, but apparently it’s an incredibly effective system for deterring thieves. More fun facts we picked up that day were a few useful Swahili phrases. “Hello” is “Jambo”, “What’s up” is “Mambo”, a white person is “Muzungu” and one of our favourites is “thank you very much” which is “Asante Sana”… For those of you that have seen the Lion King this may be familiar. “Asante Sana, squashed banana!” Actually, the Lion King is more useful for Swahili words than I would have thought. “Simba” means Lion, and “hakuna matata” ACTUALLY means “no worries”. When our waiter at dinner later asked us if we needed anything and we said no, he replied with “hakuna matata”. We laughed thinking he was joking, but that is honestly a well used phrase here in Kenya. On our way back to the camp ground, we asked to drive by the slum area of Nairobi. 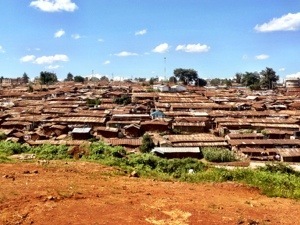 Nairobi’s slum is the second largest in Africa, housing over 600 000 people! (That’s twice the size of South America’s Rohcina favela in Rio ). The houses sprawled across the area: brown, rusted and made of makeshift scrap material. We saw some kids swimming in a large brown puddle on the side of the road, right in the middle of a construction zone. They looked like they were having a blast, but it was a sad fact to see such standards of living. For dinner that night we went to this highly recommended restaurant called “Carnivore”. Since Kelsi and I are both essentially carnivores ourselves, we figured we’d fit right in! 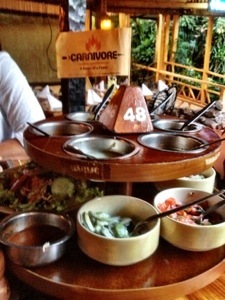 The premise behind carnivore is “all you can eat meat”. Each table is given a little flag; when you can no longer eat any more, you have to “surrender” your flag by knocking it over. Challenge accepted! Everyone is given starters with their meal. Spinach soup, bread and butter, small corn on the cob chunks and a delicious salad with all the accoutrement you could need. Then comes the meat… Each with a different spice or sauce to go with it. The usual beef, lamb, chicken, turkey, pork ribs etc. And then the slightly more unusual crocodile, ostrich and ox balls. We obviously tried it all, and everything was incredible! 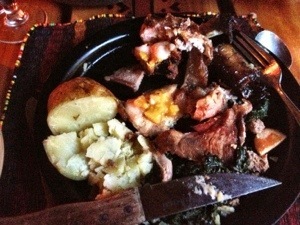 Waiters came around with large skewers and sliced off chunks of each meat to put on our sizzling hot, cast iron plates. We ate and ate, and ate some more. For about 2 hours the two of us sat there trying to finish all the protein on our plates. Finally, when we felt like we were going to explode, and when both of us could no longer hold a conversation because of our meat coma, we surrendered our flag. … Then came dessert. I’m amazed we got through it to be honest. When our driver came to get us three hours after dropping us off, we were ready for bed. We skipped out on any kind of socializing at the bar (because I think a beer would have killed me) and I passed out as soon as my head hit the pillow. The next day we failed at any and all cultural experiences. We tried to catch a local soccer match, but no one could figure out when and where the teams were playing. So we spent most of the day at the camp’s pub meeting all the other travelers who were trickling into the hostel to start or finish their tours. At 5:00 that evening we had a pre-tour meeting. There were 22 of us on the trip, with 5 more joining us a few days down the road. Kelsi and I are on a full, 42 day excursion to Cape Town, but most everyone else drops off at different points along the way. We got the details of the trip from our guide Chris, and then were sent back to the bar to get to know everyone! The next morning, after a night out at the local nightclub, we all hauled our exhausted bodies into our respective tour groups and hit the road. We grabbed some snacks, water and toilet paper for the road and set out for the Tanzanian border. Day 1 of our 42 day excursion had begun! 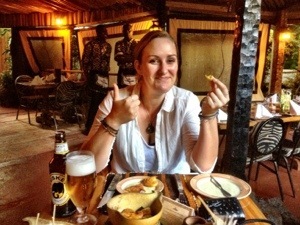 This entry was posted in Africa, Kenya and tagged Africa, carnivore, Kenya, Nairobi by hilarylust. Bookmark the permalink. hey hillary. trip sounds awesome. like the pics with the plog. keep them comeing. stay safe. Thanks Uncle Ron! The Internet here is few and far between, but I’m trying to get as many posts in as I can! Hope all is well with you, chat soon!